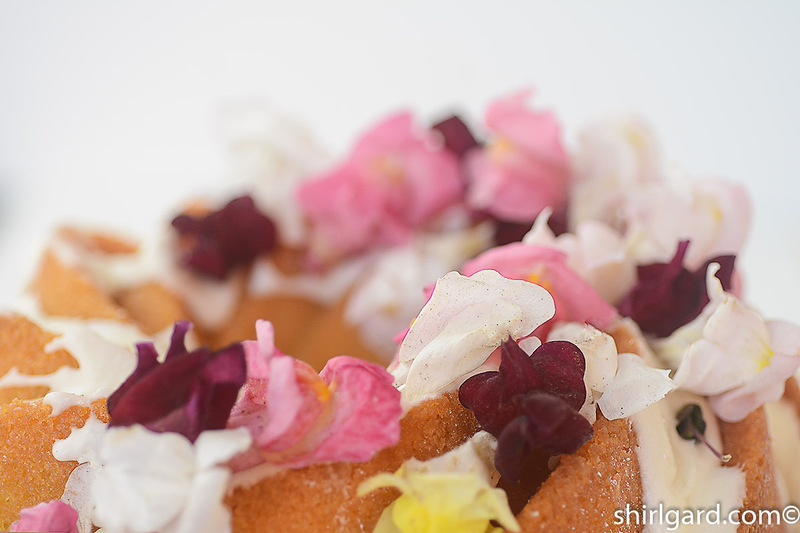 Of course, you can drizzle a simple glaze onto a Bundt Cake and make it look beautiful, or just dust it with powdered sugar, but in this post, I’m going to show you how you can make them even more special with my “three ways to jazz up a Bundt Cake”: 1) A Cascade of Fresh Raspberries 2) A Handful of Edible Flowers 3) An Inverted Rose & Rose Petals. But wait! 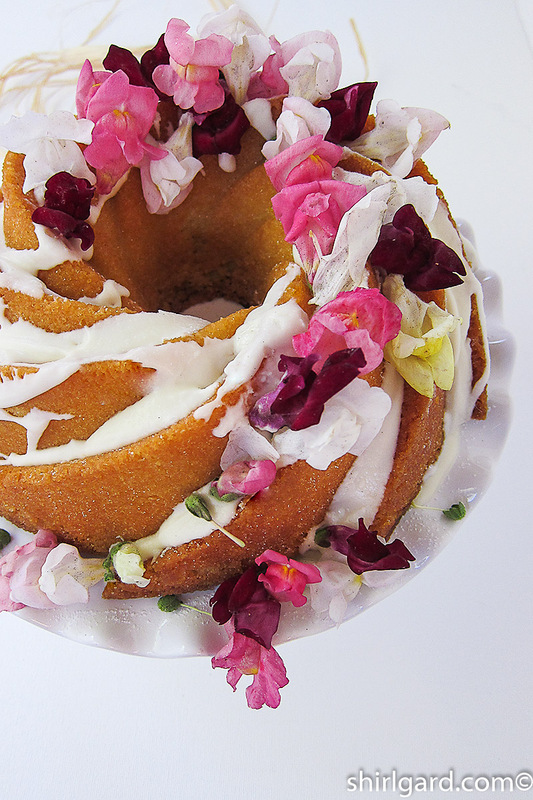 Before you can decorate, first you have to have a freshly baked Bundt Cake. 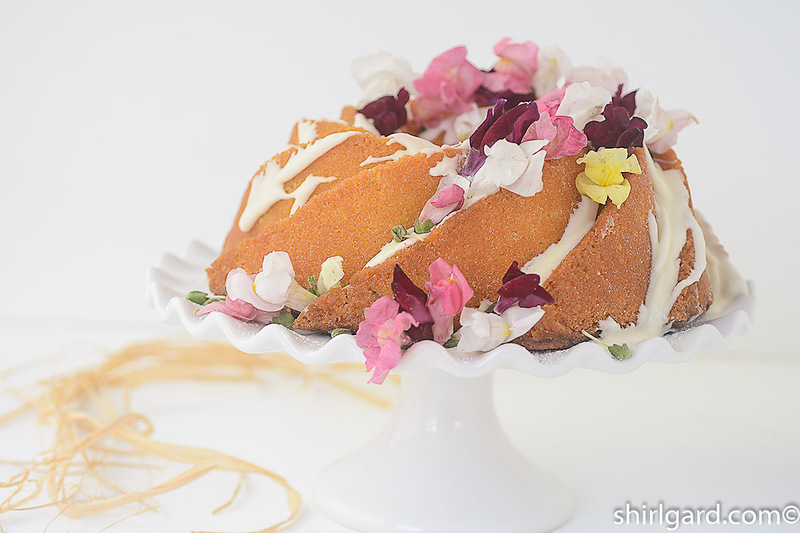 In order to get that, you need a really good and dependable recipe so you can go in the kitchen and just bake without worrying whether or not it will turn out alright; I think I have just the recipe and here it is. 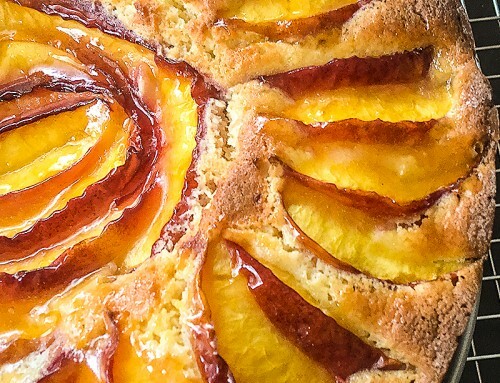 I’ve been making this recipe for almost ten years, since Shirley Corriher came out with her scientifically instructive cookbook in 2008 called BakeWise (2008). Before that, I learned so much about the science of cooking and baking from her earlier book, CookWise (1997). Both of these books are not only science, but recipe books as well, and are listed in Shirl’s Bookshelf: Favorites & Credits. 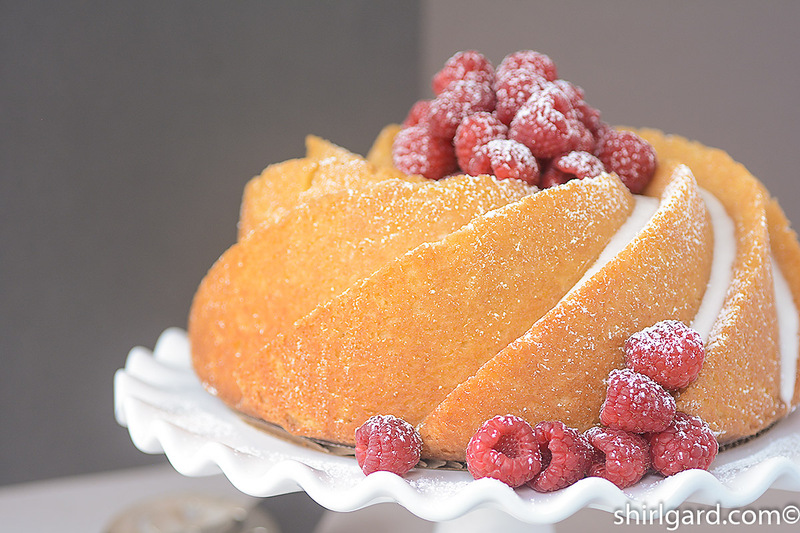 Let me describe this super cake: it has a somewhat dense but soft texture; it is also very moist and has a fresh lemon-y flavor. If you start with a little piece, you will undoubtedly have to have another “little” piece, and then another. At least, this is what I do. 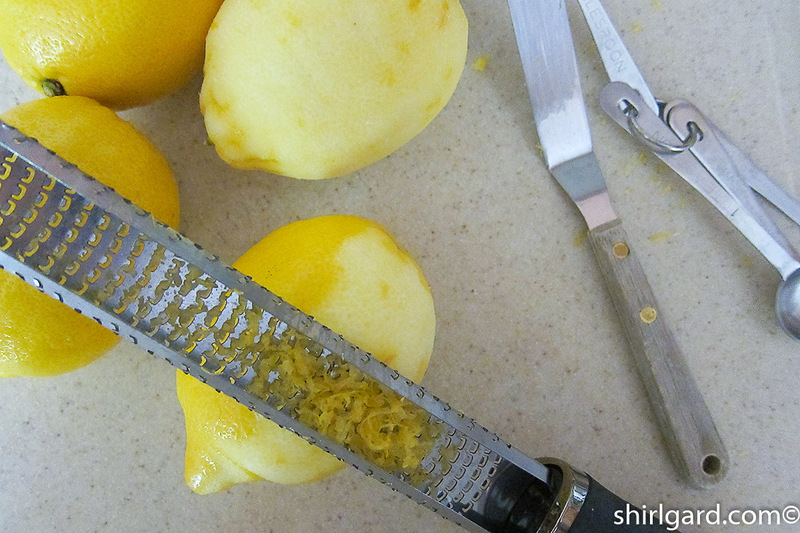 Tip: When you use a rasp grater like this, chop the zest with a chef’s knife so the zest won’t be “stringy” in your cake. Sifting flour and almond flour through a fine mesh strainer. 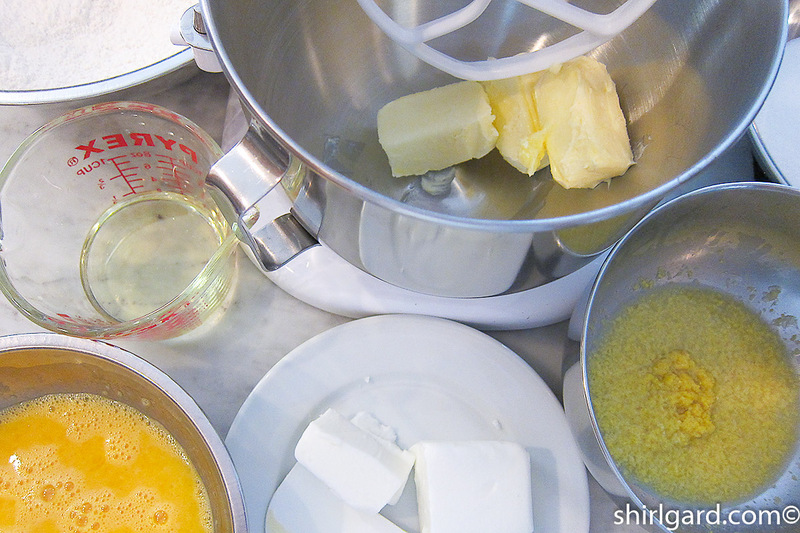 Mixing butter, shortening and sugar until texture very light. Ready to add rest of ingredients. Finished batter ready for the Bundt pan. 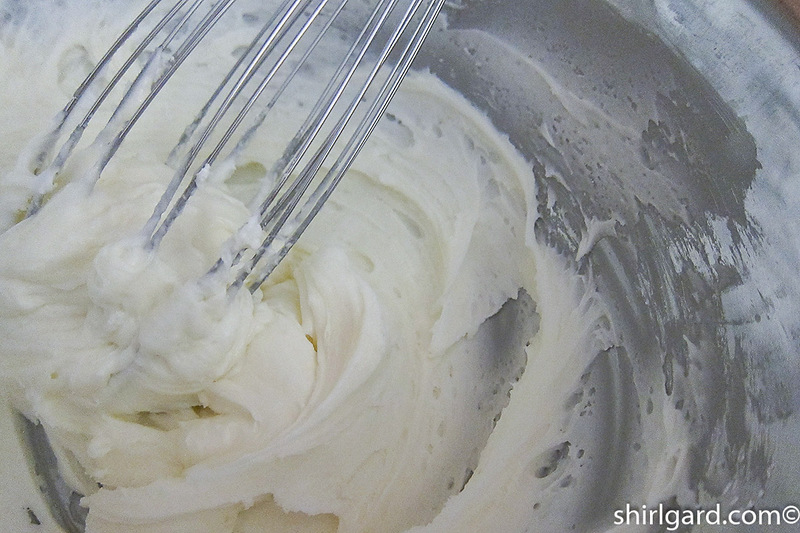 Gradually swirl in the cream with a whisk. 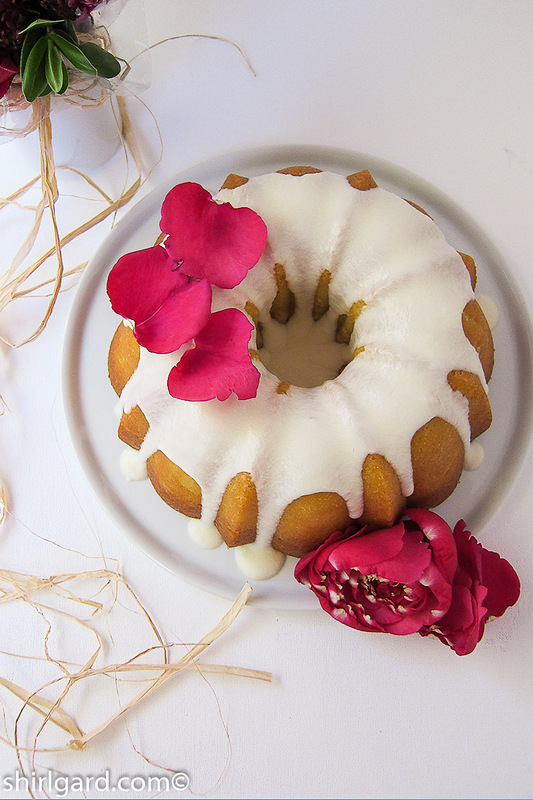 When I was pastry chef at The Old Inn On The Green, we made many of these Lemon Bundt Cakes for the front counter at The Southfield Store. Then, if sometimes we didn't have one, someone would invariably ask "when?". 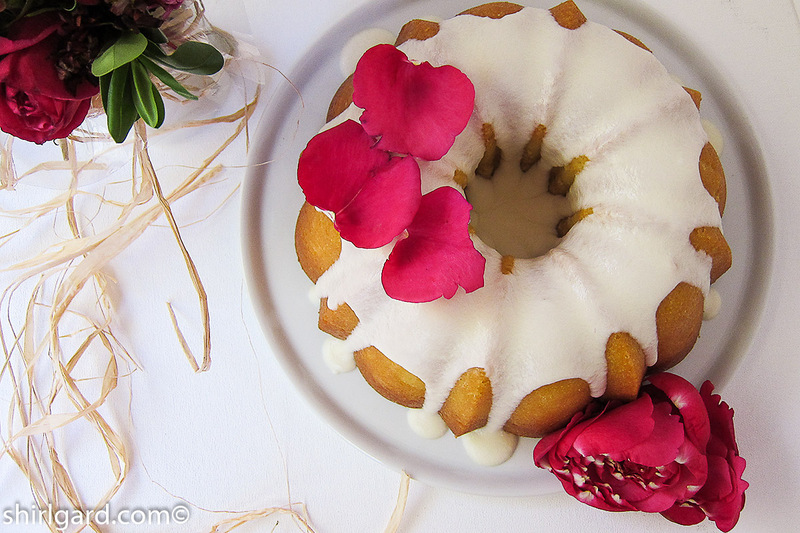 It is a recipe that I cherish and is my #1 go-to recipe for a Lemon Bundt Cake. 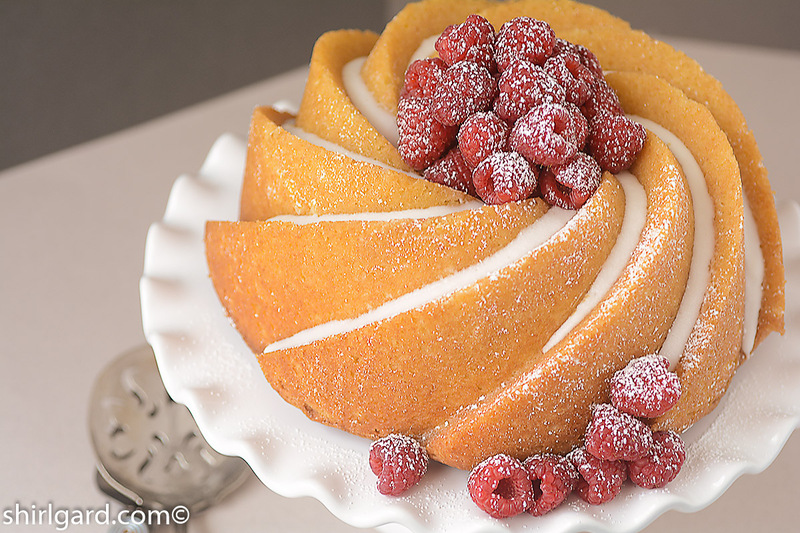 PREP BUNDT CAKE PAN: Spray pan generously using non-stick spray with flour, such as Pam or Baker's Joy, making sure to get into all of the grooves. Spray again just before filling pan with batter. 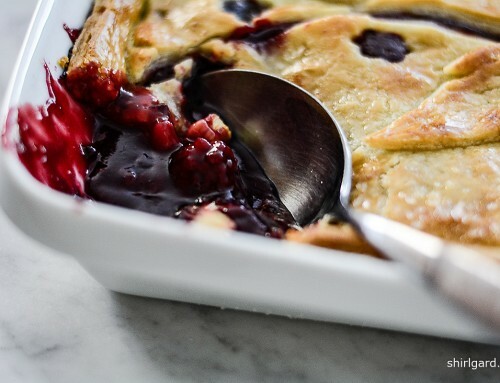 Place pan on parchment-lined sheet pan. 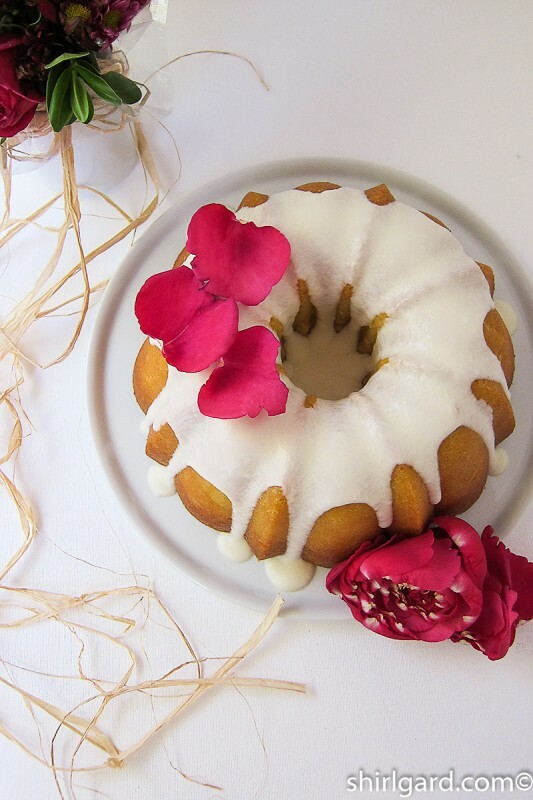 Or use Homemade Pan Grease, which is a thick paste that your brush on the Bundt Pan, creating a surface that releases the cake cleanly. 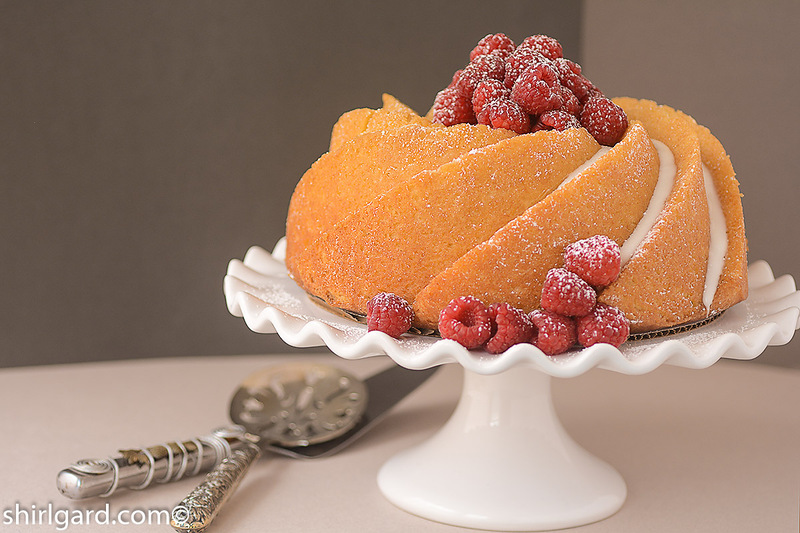 This is a product that can be stored at room temperature and something we always had on hand in the bakeshop for brushing all kinds of cake pans. 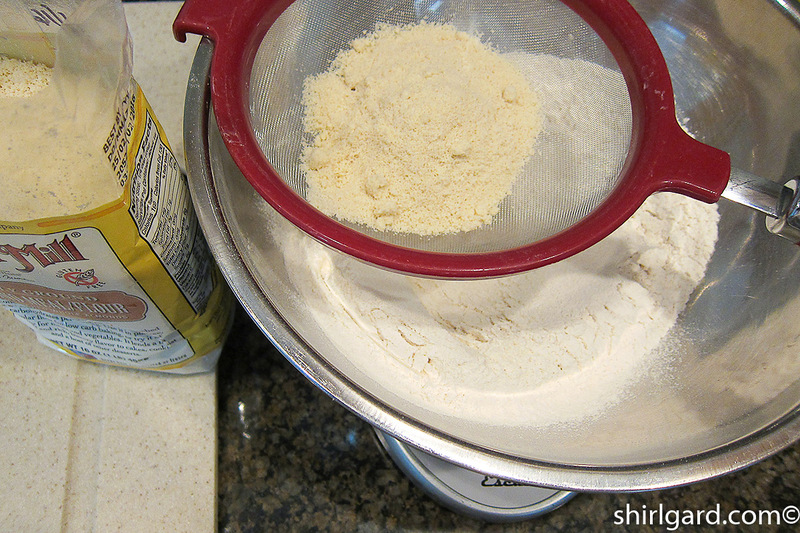 TO MAKE HOMEMADE PAN GREASE: Mix in mixer until thoroughly blended 3 parts Crisco to 1 part all-purpose flour by weight. 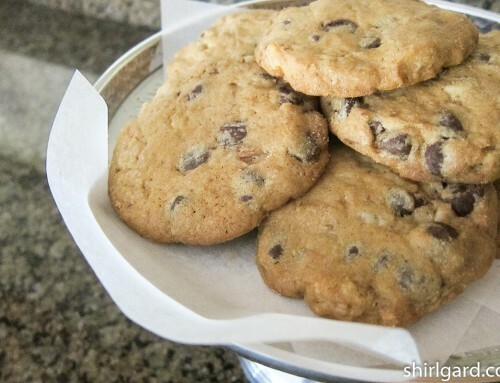 Example: 450g (1 lb) Crisco + 150g (5¼ oz) (1 cup + 1 Tablespoon all-purpose flour). PRE-HEAT OVEN TO: 325° F (165° C). 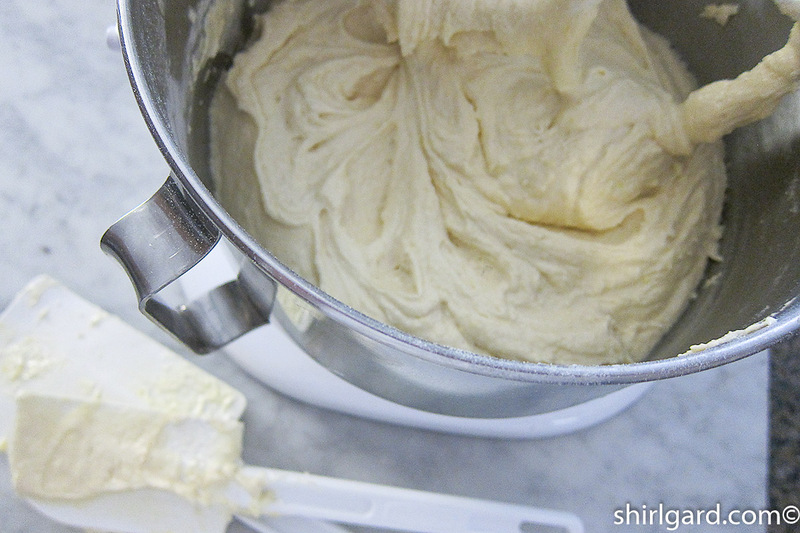 BEAT the butter and Crisco on medium speed to soften, using a Kitchen Aid or other mixer, fitted with paddle. Continue beating until the mixture is light and pale in color, about 3 minutes. 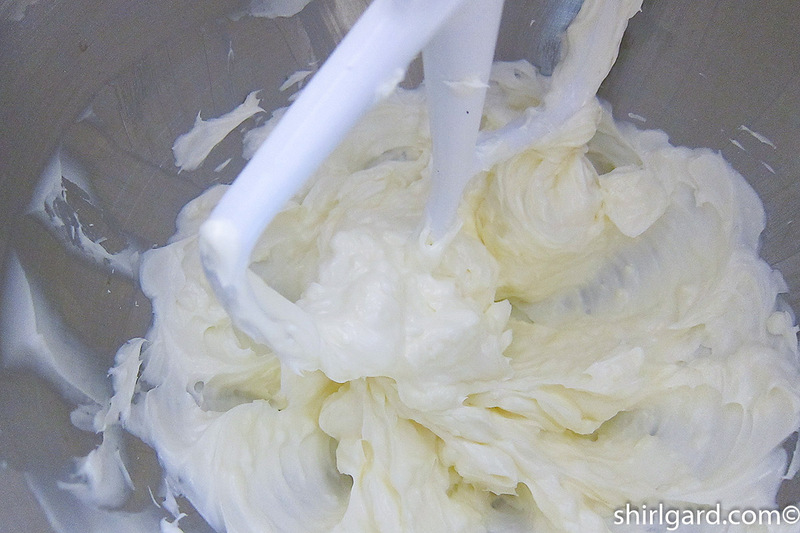 Add the sugar gradually and continue to cream until very light, another 2 minutes, a total of 5 minutes creaming. Scrape down the sides and the bottom of the bowl. COMBINE the canola oil, lemon extract, lemon juice, and lemon zest in a small bowl; add to the mixer and mix in. 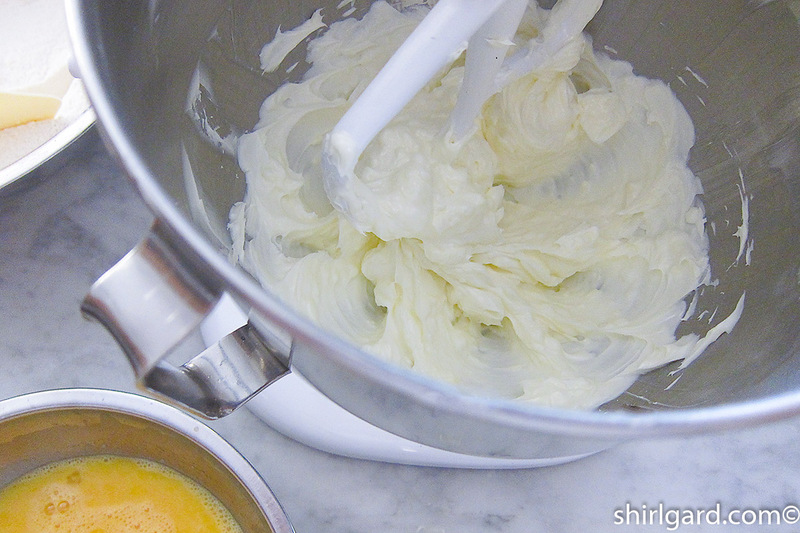 WHISK whole eggs and yolks until smooth and gradually mix into the batter on low speed. SIFT together the flour, almond flour, baking powder, and salt, using a large seive or tamis set over a large bowl; whisk to blend. 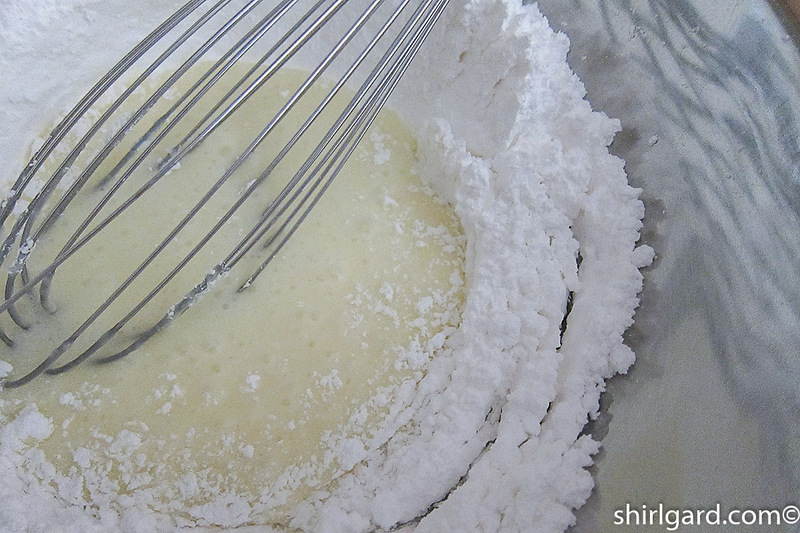 ADD the flour mixture in three additions, alternating with the buttermilk in two additions, beginning and ending with flour. Pulse in after each addition on lowest speed. SCRAPE down the sides and all the way to the bottom of the bowl, pulling up the batter and any loose flour from the bottom to the top. Mix again briefly just to smooth out the batter. 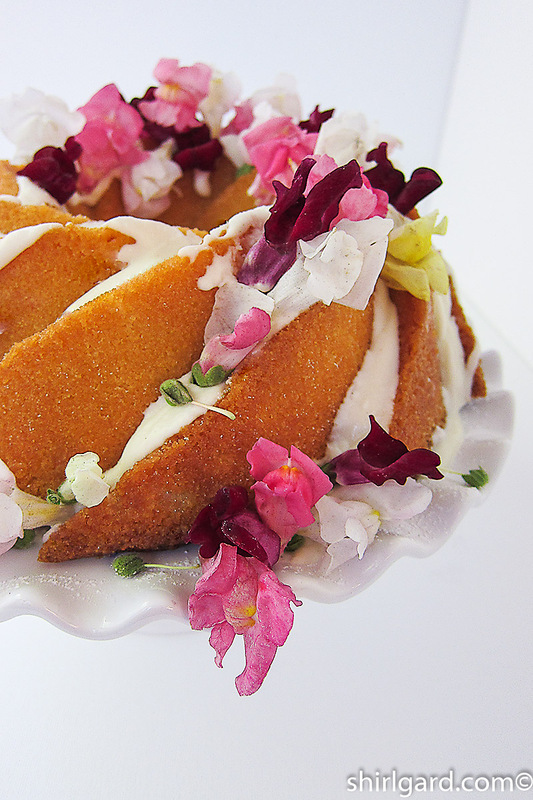 SCALE the batter into prepared bundt pans and tap lightly on counter to knock out any bubbles. Smooth the tops evenly with a small offset spatula. 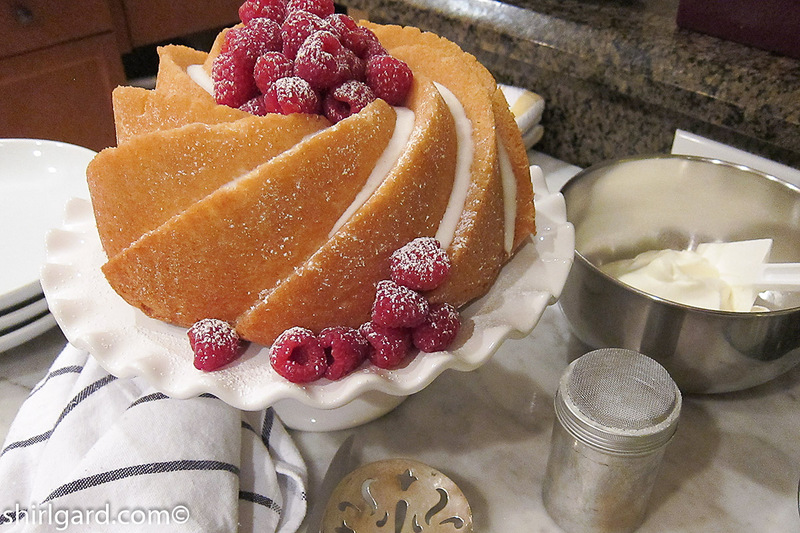 LARGE 10" BUNDT PANS (12-cup): SCALE @ 1800g (4 lb.). 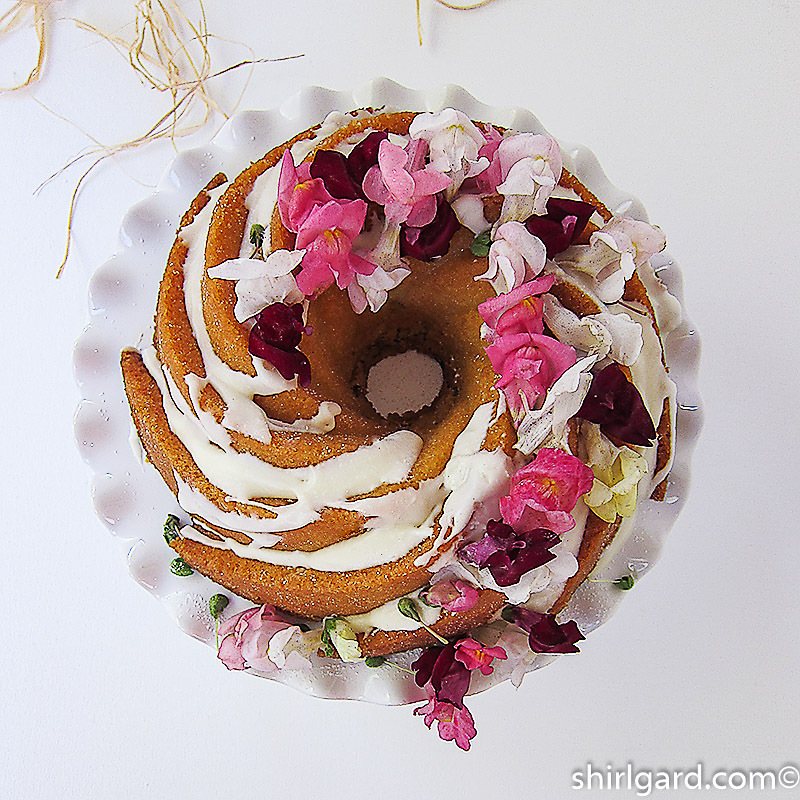 MEDIUM "SWIRL" BUNDT PAN (10-cup): SCALE @ 1350g (3 lb,). 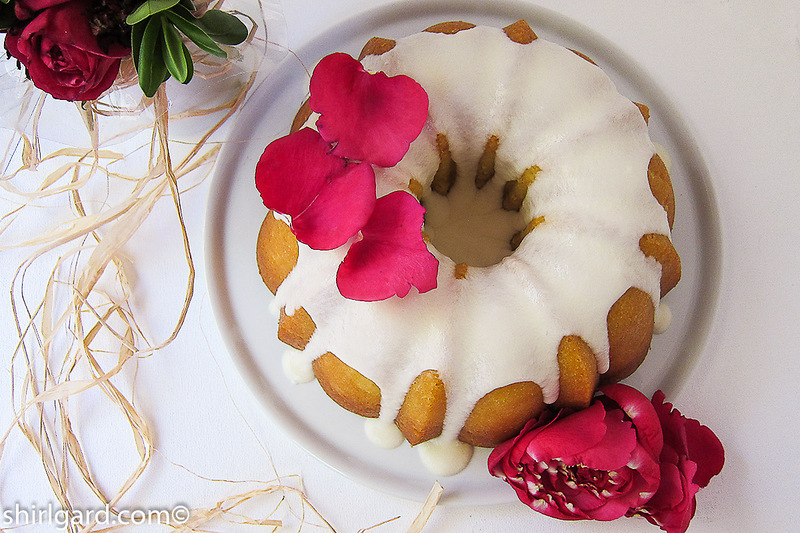 SMALL 8" BUNDT PANS (6-cup): SCALE @ 900g (2 lb.). 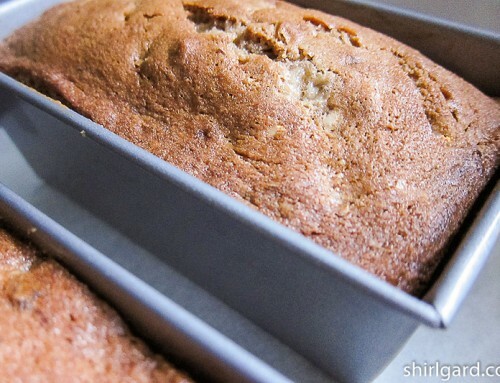 Note: batter should fill the pan no closer to the top than 1-inch.. Place pan on the parchment-lined sheet pan. 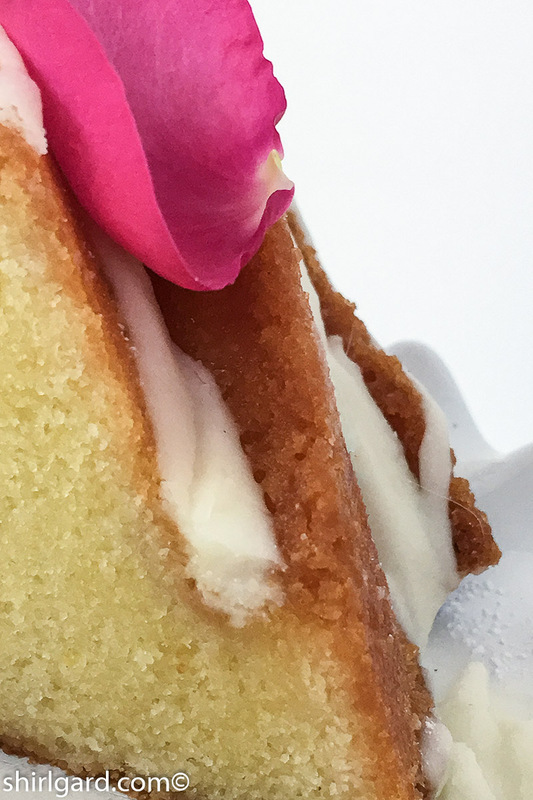 BAKE @ 325° until a cake tester or wooden skewer tests clean, and the cake springs back when touched; the color should be a golden brown color. If using a thermometer, the internal temperature should be between 210° - 212° F (99° - 100° C). Approximate baking times are as follows, although ttimes will vary depending on your oven. Start testing for doneness 10-15 inutes before the estimated time is up: LARGE PANS (12-cup) 1 hour 35-40 minutes. MEDIUM SWIRL PANS (10-cup) 1 hour to 1 hour 5 minutes. 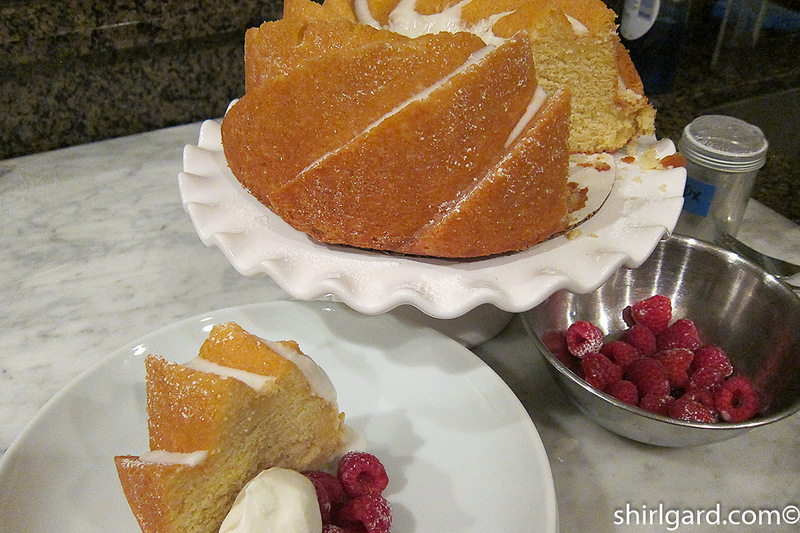 If you have SMALL BUNDT PANS (6-cup), BAKE 45-50 minutes. TRANSFER the pan to a rack and allow to cool about 15-20 M before unmolding. 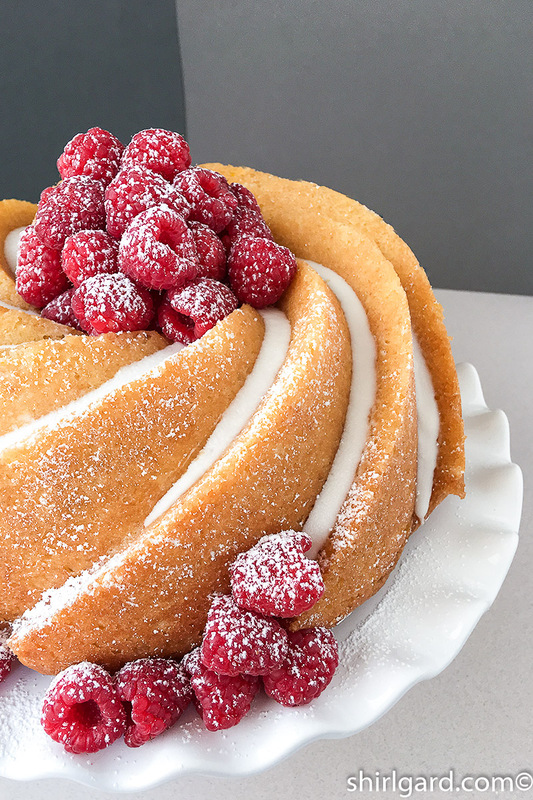 Gently loosen the cake around the top and invert onto a platter or cake board to finish cooling: 10" for large cakes, 9" for medium cakes, or 8" for small cakes. 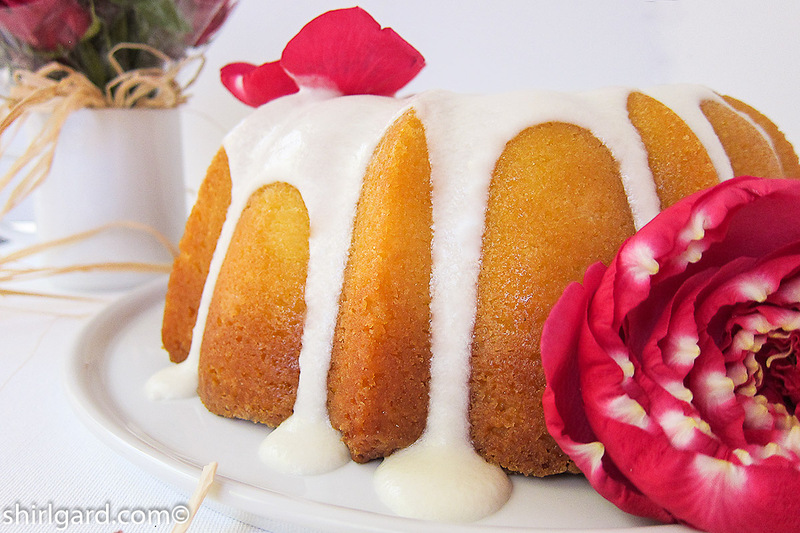 WHILE THE CAKES ARE BAKING: Make the Lemon Syrup (See recipe below). 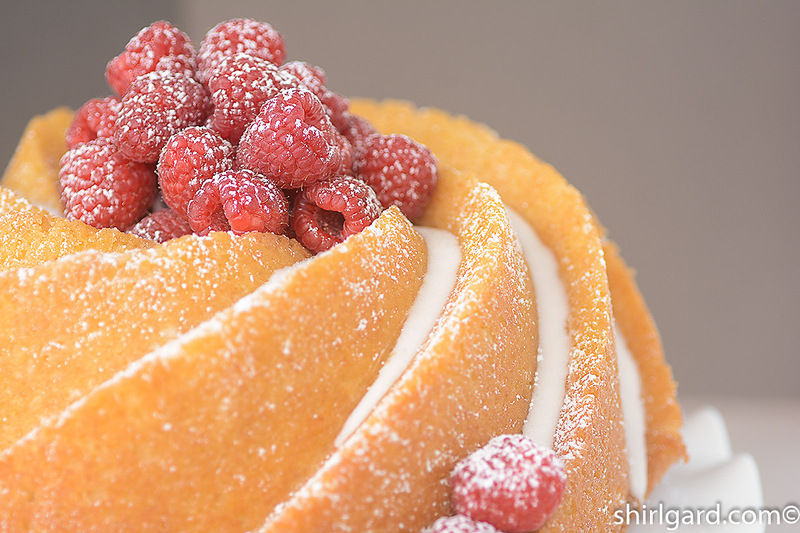 As soon as the cakes are unmolded, while still hot, brush several times with the Lemon Syrup using up all of it. Also make the Bundt Cake Icing (See recipe below). TO SERVE: When ready to serve, drizzle on the Bundt Cake Icing. 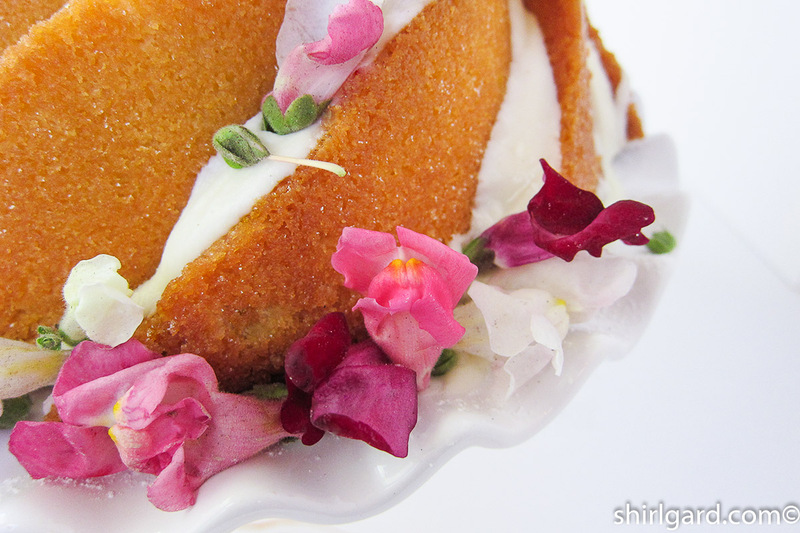 Refrigerate to let the icing set before slicing. 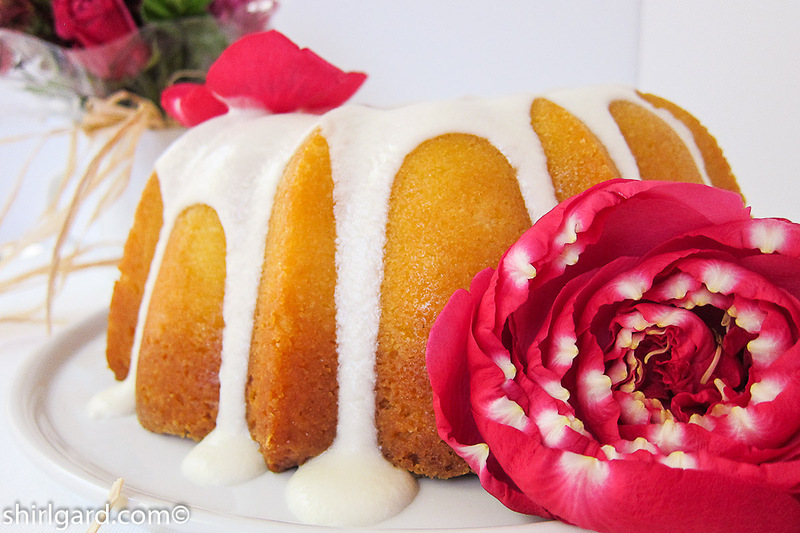 Cut large bundt cakes into 16 servings, medium cakes into 12 servings, and small cakes in to 8 servings. TO MAKE LEMON SYRUP: Combine 80g (1/3 cup) lemon juice and 100g (1/2 cup) sugar in a small sauce pan = 180g Total (about 6 oz). 1) Heat until sugar is dissolved. 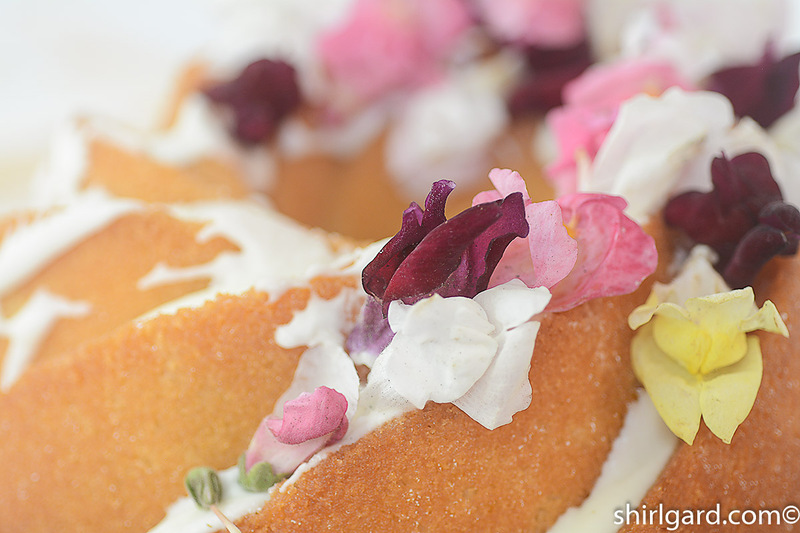 2) Brush and re-brush hot syrup on hot cakes until all the glaze is absorbed. 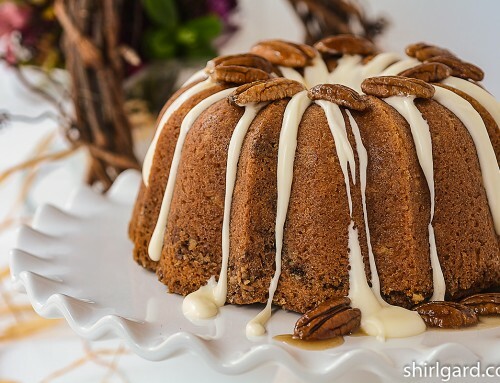 TO MAKE BUNDT CAKE ICING: (PROPORTIONS FOR ONE CAKE) 60g (1/4 cup) heavy cream chilled, 180g (1½ cups) confectioners' 10X sugar sifted, ¼ teaspoon vanilla extract = 240g Total (about 8½ oz). 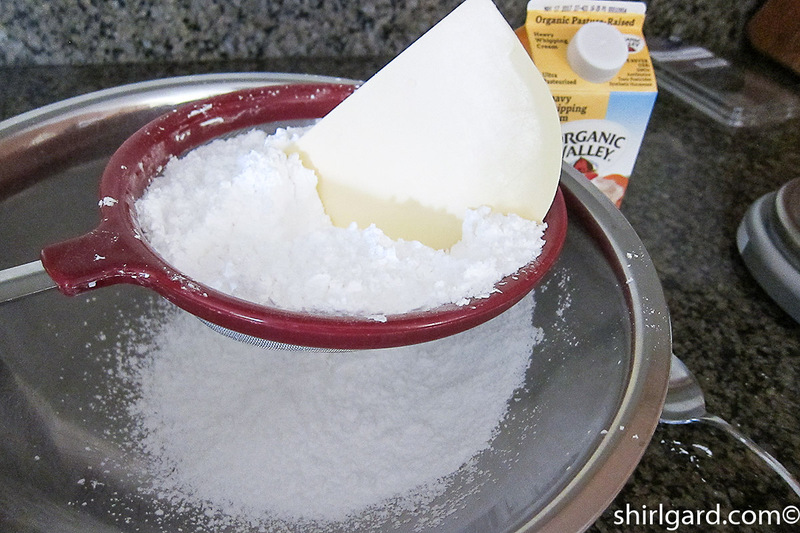 (Ratio = 3-1 sugar to cream).1) Whisk cold cream into powdered sugar, beating until the mixture is smooth and glossy. 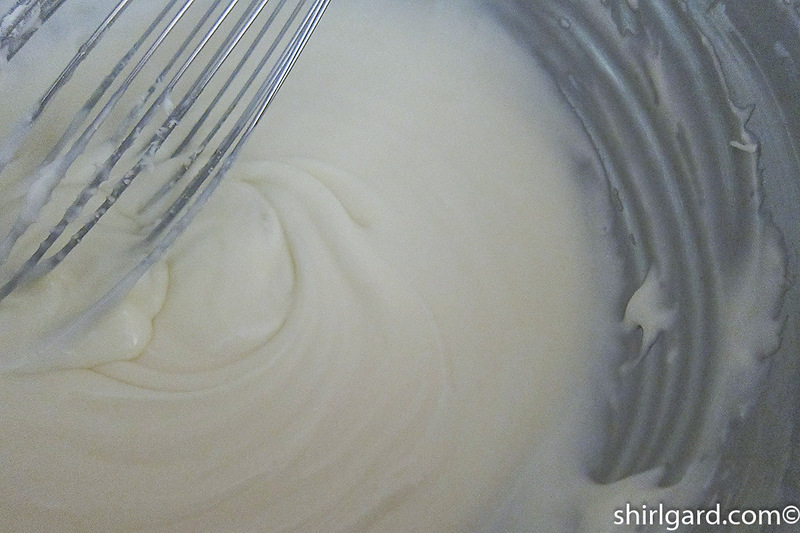 2) Whisk in vanilla. 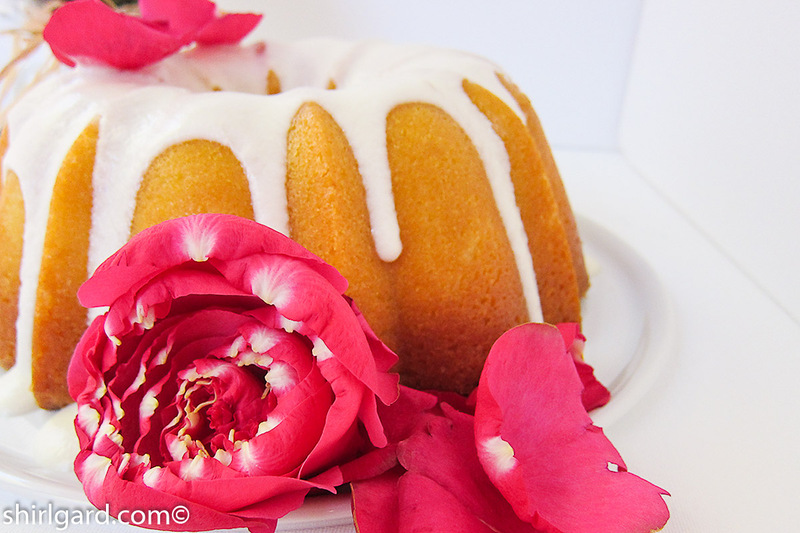 3) Adjust consistency, as desired, with more cream or sugar to make a thick icing that flows easily from spoon. 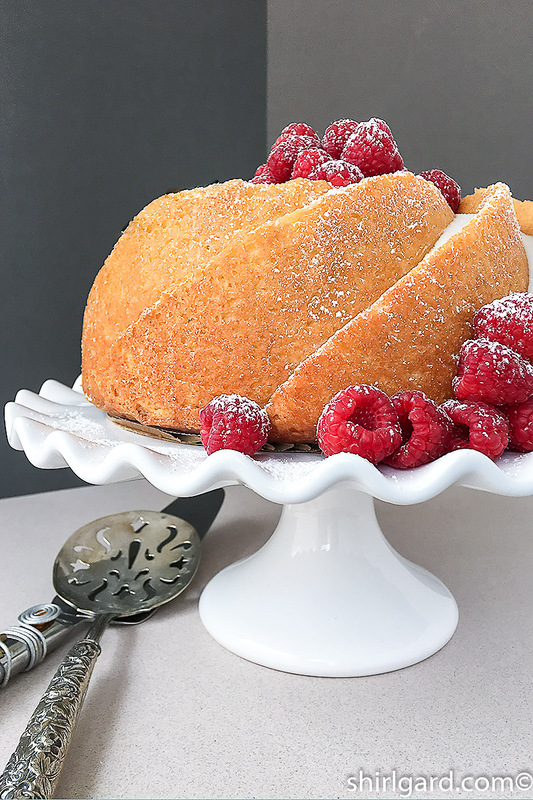 Adapted from Original Recipe for "Take-Your-Breath-Away Lemon Pound Cake" in Bakewise by Shirley Corriher (2008).